On our way to Door County, Wisconsin we decided to stay for the night in Port Washington. We did not know anything about the town and were pleasantly surprised to find a wonderful small town. It had a great little harbor, beautiful flowers in bloom, a memorial to fallen fisherman, and not just one, but two great lights. 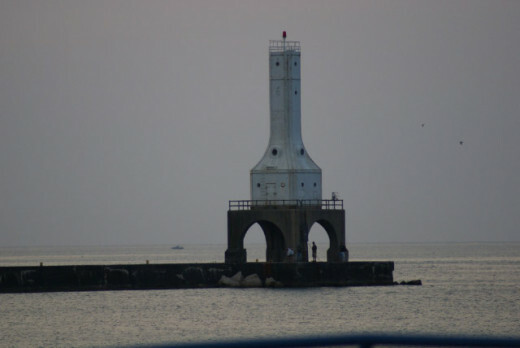 One, sitting on a hill overlooking the harbor, was an old lighthouse and in the harbor stood a fascinating looking art deco pierhead light. 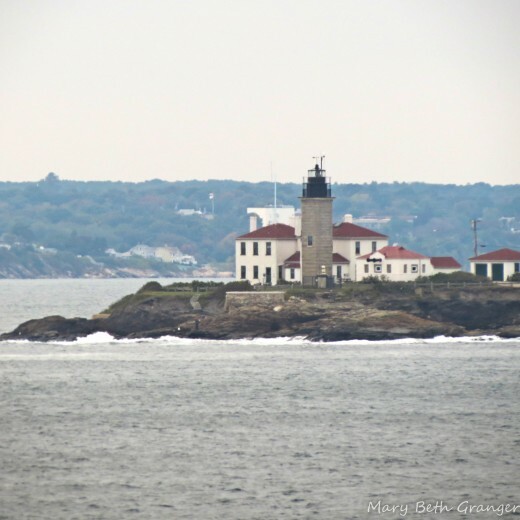 On this page, I will showcase photos of the lighthouses and also give you a flavor of the town with photographs of the harbor, flowers and fisherman's memorial. I hope you enjoy this brief look into Port Washington, Wisconsin. the bluff overlooking the harbor. 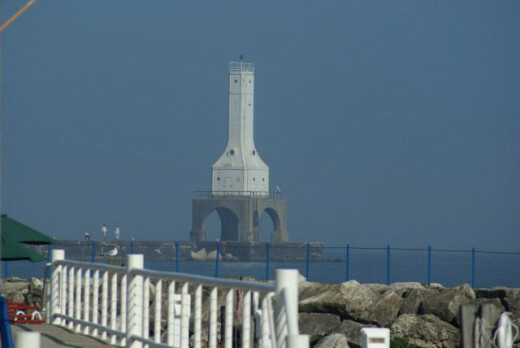 The first pierhead light was built in Port Washington in 1889 and was a pyramidal wooden framework tower. In 1935 the current pierhead light station was built. It is a art-deco style. This light is now serviced by the Coast Guard out of Milwaukee. 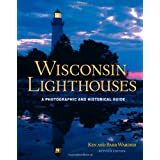 Are you planning a visit to Wisconsin? Here is a guide book I would recommend to help you find the best places to visit. 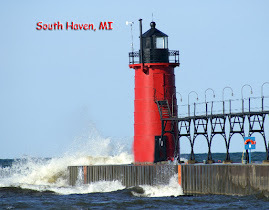 There is a red light atop the lighthouse that is a harbor light. 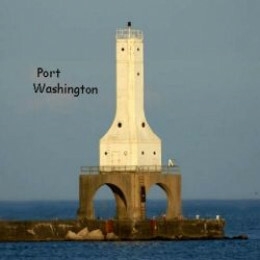 It flashes once every 6 seconds and is visible to boats 8 miles out in the harbor. There is also a fog horn that is mounted on top of the lighthouse. It gives 2 blasts every 30 seconds at 24 second intervals. 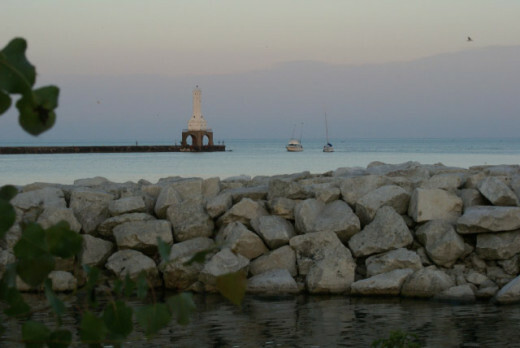 The pierhead light is connected to the harbor by a breakwater made of steel decking, large stones and concrete. You can walk out to light along the breakwater which is 2500 feet log. In this photo you can see the large number of people that gather under the light to fish or just enjoy the view. I thought I could capture the lighthouse without so many people around it if I got up very early. I was up before dawn and still there were people around the pierlight. Here is a lone early morning fisherman just under the lighthouse. 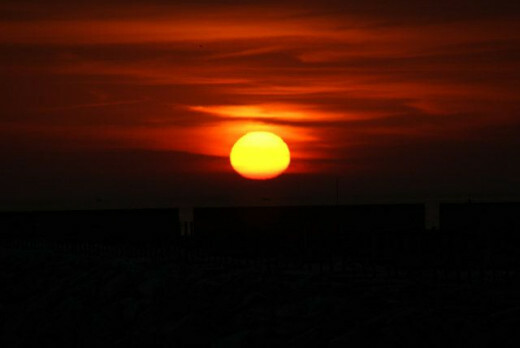 I decided to get up very early to try to get some photos of the sun rising over the lighthouse. I wasn't able to get the lighthouse in my shots, however I was rewarded for my early morning outing by some spectacular sunrise shots. The sky was somewhat cloudy so at first I didn't think I'd catch the sunrise, but then all of a sudden it was there, coming out of the clouds. Well worth the wait!! I love the way the sun went in and out among the early morning clouds. 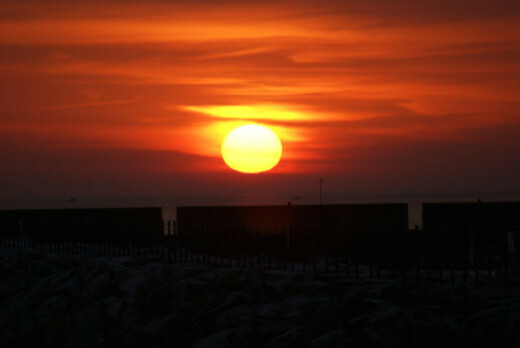 The Fishermen's Memorial was built to honor those people who lost their lives in the local commercial fishing industry. The memorial is located in Rotary Park on the harbor in Port Washington and also gives information on the art of commercial fishing. 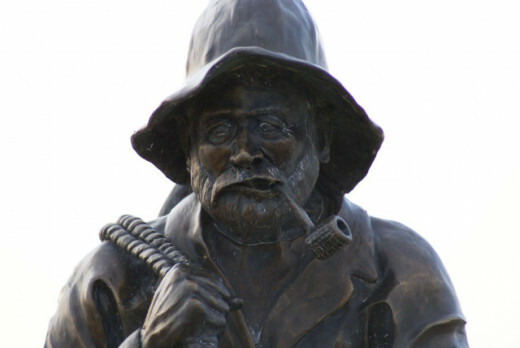 The memorial consists of a wonderful statue of a weathered looking fisherman toting a huge fish tied to a rope. Surrounding the fisherman are stands the include information about commercial fishing and tributes to fishermen who have lost their lives. 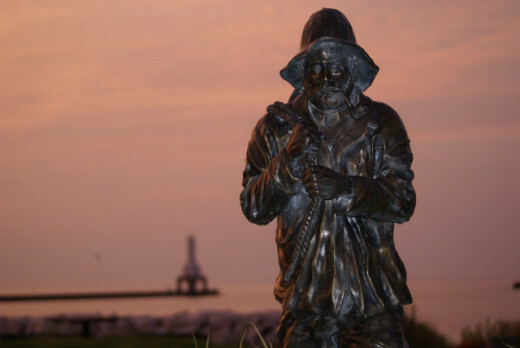 More information on the Fisherman's Memorial can be located on theWisconsin Maritime Trails web site. 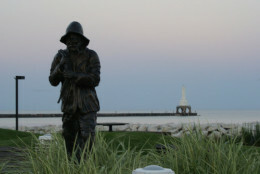 This photo was taken of the Fishermen Statue in the predawn light. It includes a shot of the harbor and art deco lighthouse in the background. I love this closeup of the weathered face of the old fisherman. 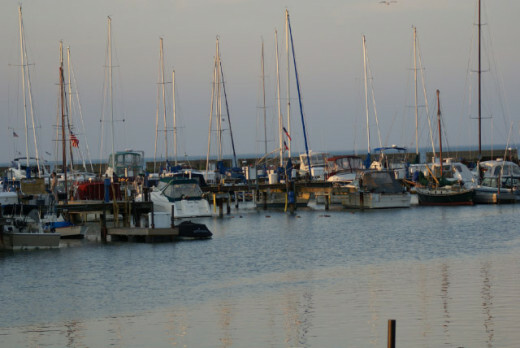 Here you see a photo of the boats in the harbor. This is a long shot that shows the pierhead lights guarding the way to the harbor entrance. 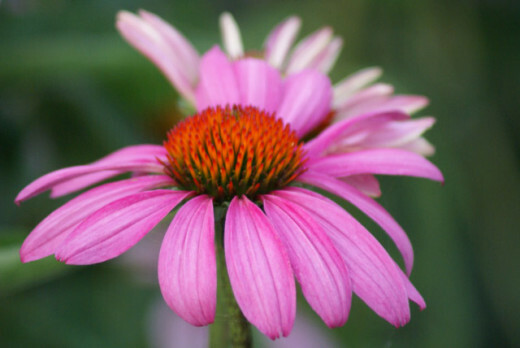 I love this beautiful Cone Flower that was growing in Rotary Park near the Fishermen's Memorial. 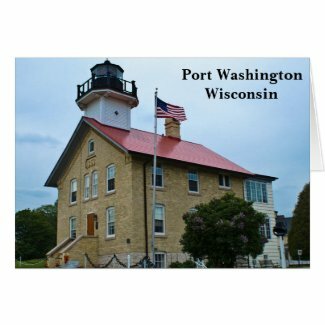 Here are some Zazzle products from my Port Washington Photos. 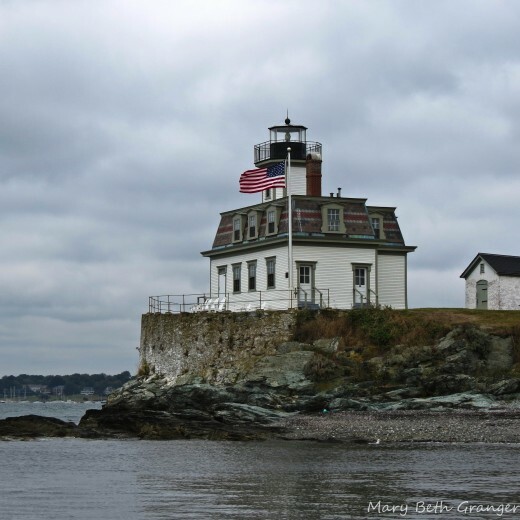 Rose Island lighthouse is found on an island in Narragansett Bay near Newport Rhode Island. It was originally built in 1870 and helped to guide ships around the rocky area near Newport. On a recent cruise stop, I was able to take a tour of Rose island and the lighthouse. The tour guide gave us interesting information on the lighthouse and I was able to explore the grounds and climb the tower to the lighthouse. The lighthouse operated from 1870 to 1970 when it was abandoned due to the construction of the nearby Newport Bridge. The Newport Bridge lit up the night and the lighthouse was no longer needed. The lighthouse then remained vacant until 1984 when a foundation was formed to restore the lighthouse. 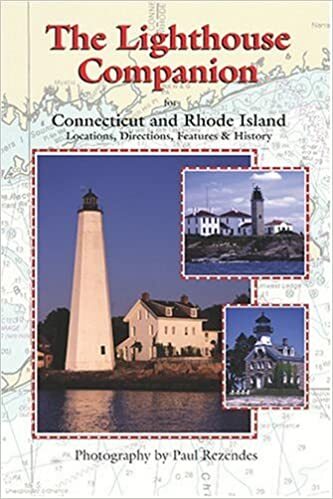 The guide below is a great way to learn more about Rhode Island lighthouses. It comes with directions to each lighthouse. Today Rose Island lighthouse is beautifully restored in early 1900's furniture and accessories. 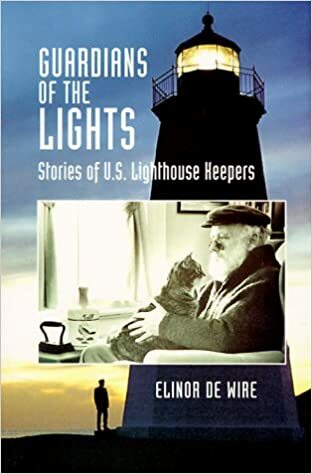 Our tour guide told us when they were ready to furnish the lighthouse they got advice from a grandson of one of the lighthouse keepers. He was able to give the ideas of where the furniture should be placed and what accessories his grandparents had in their home. 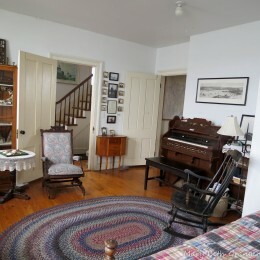 The restoration is very well done and the rugs and quilts give it a very homey feeling. I enjoyed touring the house and climbing to the top of the tower for a view of the harbor. Today the lighthouse is also available for guests who stay on the first floor and get to be honorary lighthouse keepers. Would you like to experience life in a lighthouse? For more information go to Rose Island Lighthouse Foundation. The lighthouse grounds are also home to weddings and other parties. I think it would be a great place to host an event. 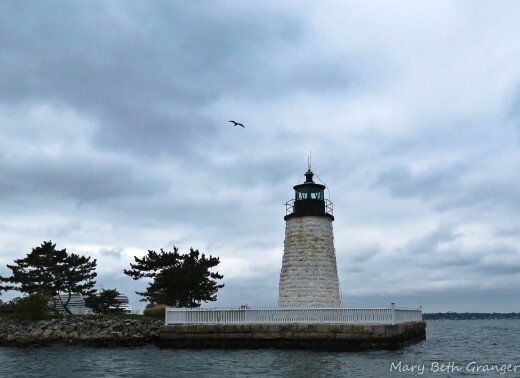 The five lighthouses that I photographed were in and around the Newport Harbor area. On our way to and from Rose island lighthouse our guide gave a us a narrative tour of the harbor. We passed by the beautiful mansions on the coastline and found out that they were summer "cottages" for many of the wealthy people who visited the area. We also saw beautiful yachts and sailboats that were moored in the bay area. One of the sights that really interested me were the other lighthouses that also were in the harbor. 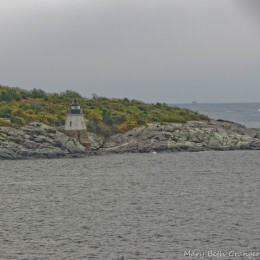 The guide pointed out two other lighthouses Lime Rock and Newport Harbor Light. He also told us of two lighthouse to watch for when our cruise ship left the area that night. I was able to capture all four of these lighthouses in my photographs. During our tour of the harbor our guide pointed out Lime Rock Lighthouse and gave us a bit of information. The lighthouse was first lit in 1854 and was run by a lighthouse keeper and his wife and small daughter. When the keeper had a stroke in 1858 his wife Ida Lewis took over the running of the lighthouse. In 1879 her daughter, also named Ida, took over the lighthouse keeper duties. She remained the keeper until 1911. 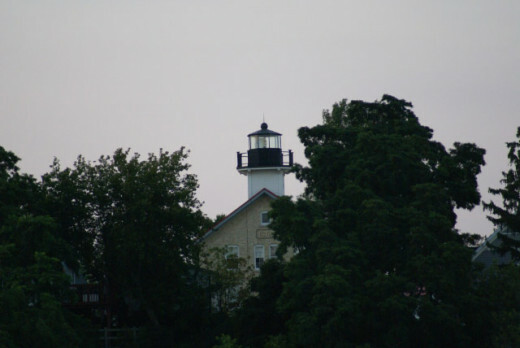 In 1924 Lime Rock lighthouse was renamed the Ida Lewis lighthouse. 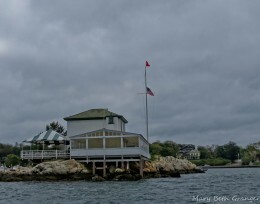 Today the lighthouse is used as a yacht club. 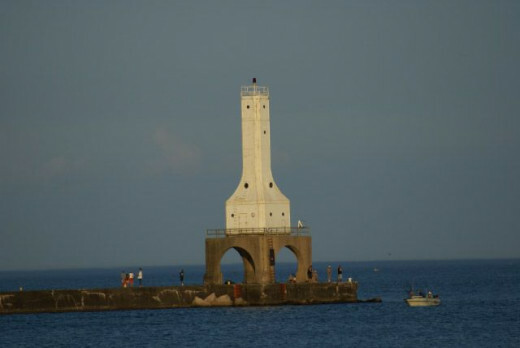 Built in 1842 this lighthouse has a 35 foot tower. Short lighthouse at the east passage of the bay. 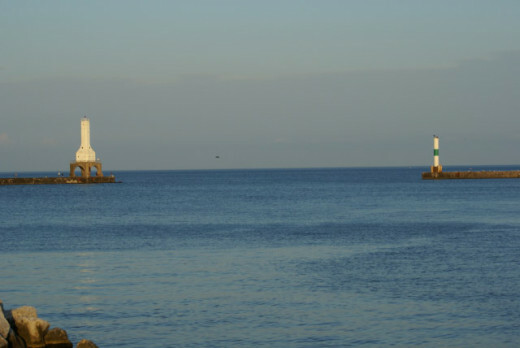 As our cruise ship left the bay in the early evening I was able to photograph two more lighthouses. The first was a short lighthouse on the eastern passage. This lighthouse is adjacent to Castle Hill Inn and Resort which sits high on the hill above the bay. I can imagine the beautiful views the people staying in this resort have of the ships coming into and out of the harbor. The lighthouse below is the second lighthouse I photographed as our cruise ship left the bay. 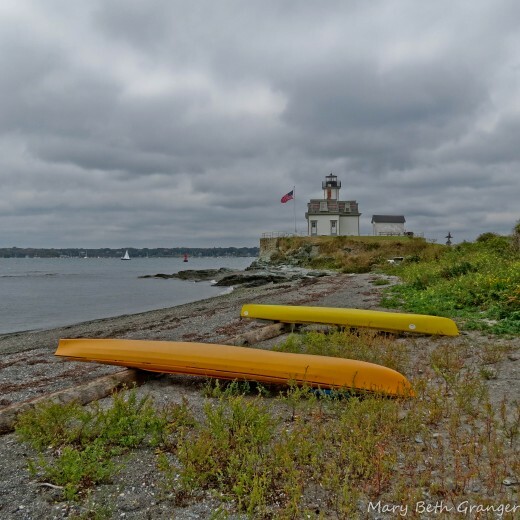 It is Beavertail lighthouse which is at the southern end of Cononicut Island. It was built in 1856 and has a 45 foot tower.